There's nothing quite like the ugly presence of very necessary technology. I like having the computer on, but I hate the look of all those wires. I enjoy printing important documents, but the printer is an eyesore. I like having internet, but the modem is so not cute. While we may not yet have a solution for hiding all of the very-neccesary-but-very-blah objects surrounding our technological needs, Heather has worked up a fix-it for hiding the modem & other small electronics. Hooray! Can you guess where? 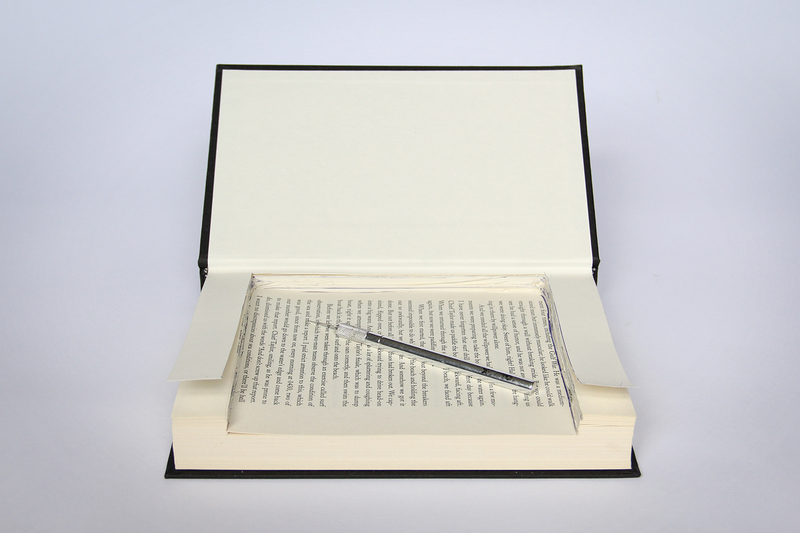 It's a spin on this ever-popular hack of hiding things inside books, with an added level of discretion on the sides. This is the project Heather was cooking up a while ago. 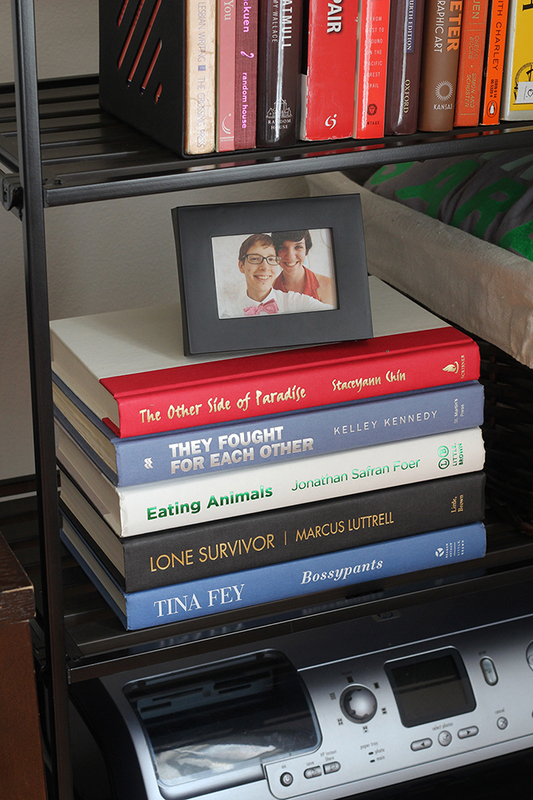 Looks like a normal pile of books, right? Woah! There's my external hard drive! Ahh, I love it. So sneaky. Step 1. Pick a Book // Pick a book that will be large enough to hide your electronic equipment. Measure your equipment, noting the length, width, & depth. Find a book whose measurements are 1/2" or so larger in the depth & the width (not including the cover). 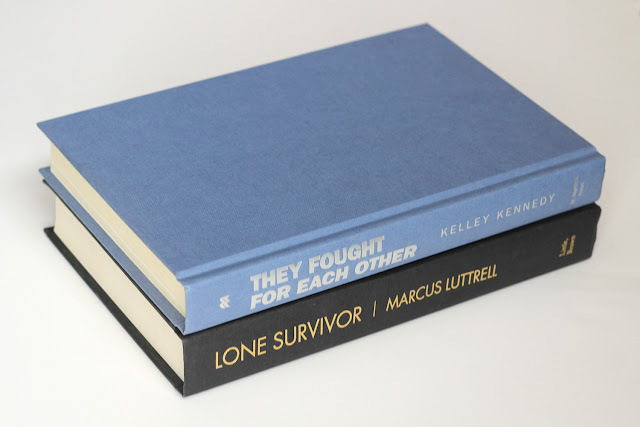 The length of the book will have to be about 1.5" more than your equipment as we'll be keeping the sides of the pages for added discretion. Step 2. Measure, Cut! 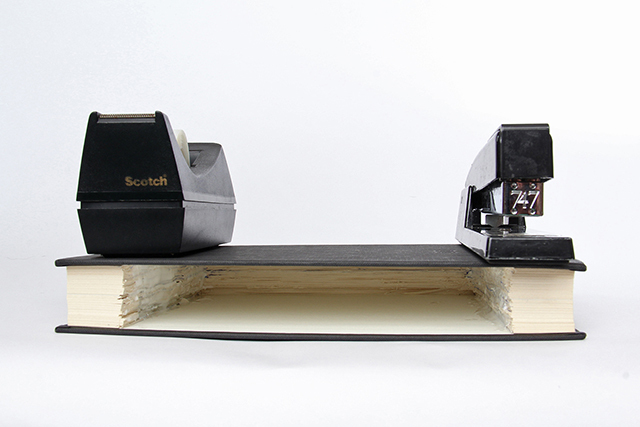 // Open your book & lay your piece of equipment down on the first page, leaving space on each side. Trace the space you'll need for your equipment to fit, plus a little wiggle room. Start cutting away at the pages, starting from the spine of the book & going to the edge of the page. You won't be able to cut all the pages at once; you'll probably only be able to get five or six at a time. Take your time, & cut straight down. Retrace your equipment size as necessary. Step 3. Seal It Shut // Once you've cut through all the pages, it's time to glue. 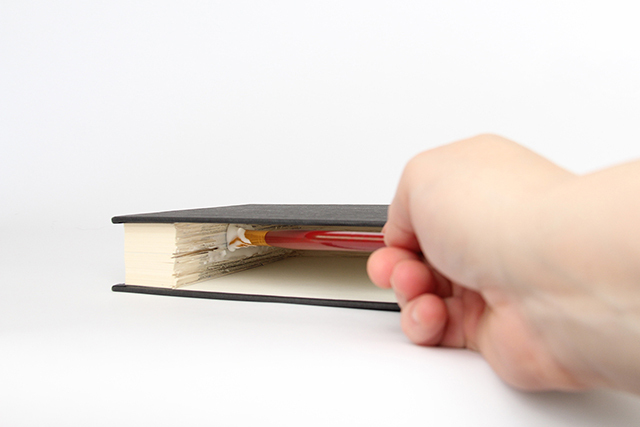 Take your paintbrush & apply glue to the inside of the hardcover where it meets what's left of the paper. You'll also need to apply glue to the inside along the pages to keep them rigid & box-like. Don't skimp on the glue! Use a big glob so it soaks through a good portion of the paper. Step 3. Wait // While the glue is drying, set something on top of the book. Don't clamp the book shut as it glues as this will change the dimensions of the paper by squishing it. 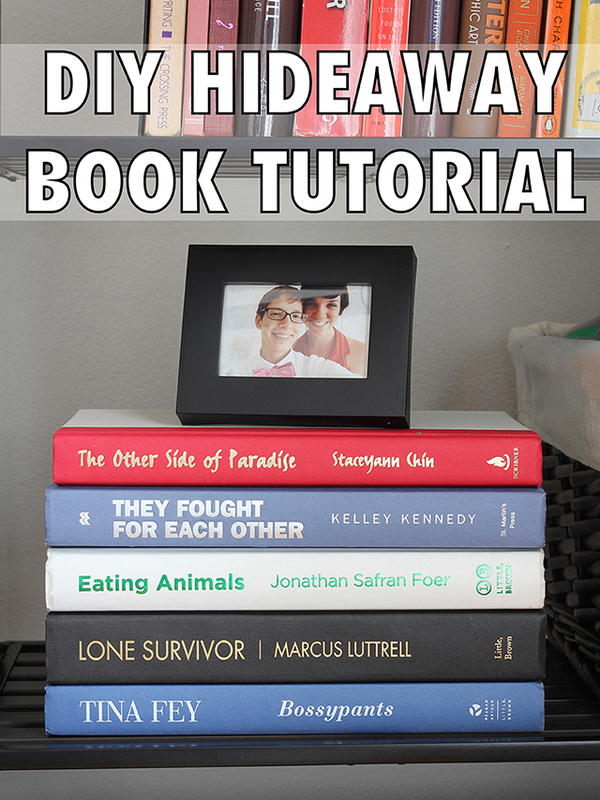 Use a weight heavy enough to keep the cover & pages together. Once the glue has dried, you're ready to hide that technology! 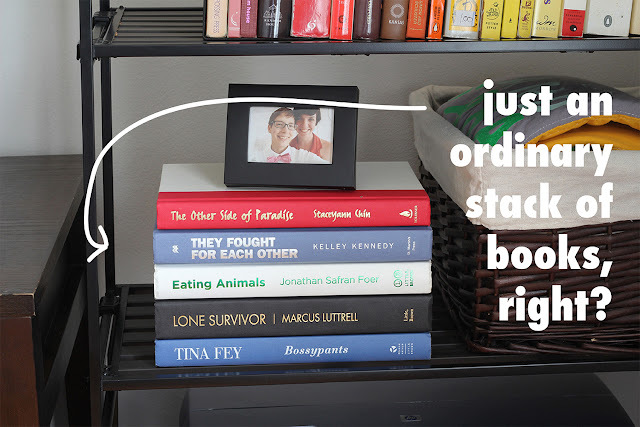 Throw some other books in there too, really throw off the scent. Undercover modem! Related // Looking for more life hacks? Check out our 1-step caramel sauce. Wouldnt the electronics get hot in there without air circulation? They do get kind of warm, but the opening in the back seems to keep them cool enough. Plus it helps if the height of the book is taller than the height of the electronic device, that way there's airflow above as well! Is there any reduction in wi-fi, trying to project through the books? 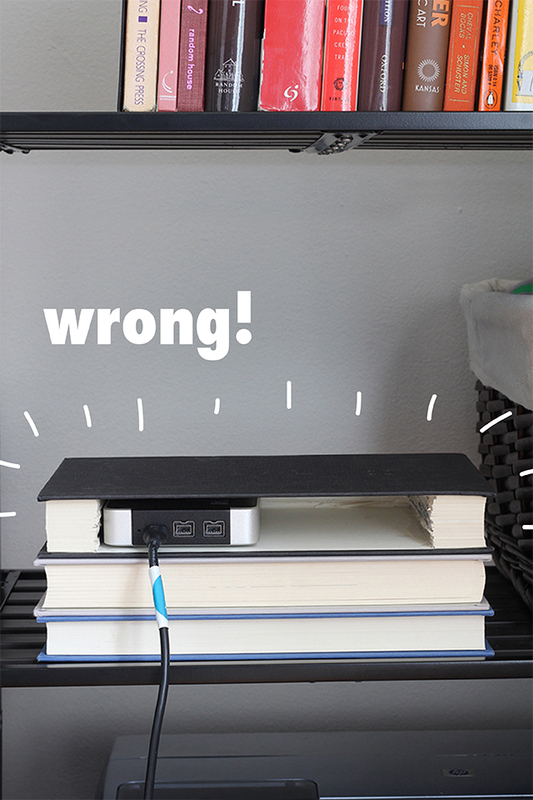 Not really, but the router is kept on an open-backed shelf, so that may help! you can put a basket attached under the back of the desk..slip the router in with the antenna peaking up. You can wrap the wires up into a clip and the router and wires are hid out of the way.